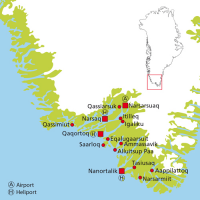 Aasiaat is located on an island on the southern and outermost edge of the Disko Bay. The island is part of an area of archipelagos, in popular speech called "the land with the thousand islands". 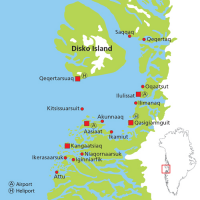 In Aasiaat you will see the massive icebergs, from the many calving glaciers in the Disko Bay, slowly drift by. There is always a lot of activity in and around the harbour, and it is well worth a visit: The harbour is full of fishing vessels and trawlers. 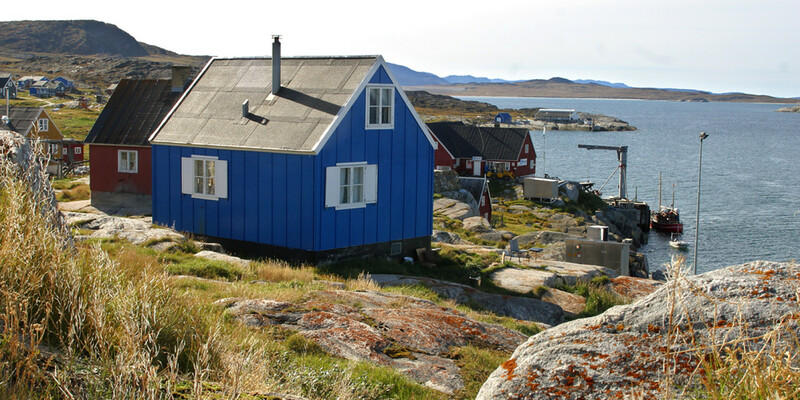 Experience life in moderne Greenland. 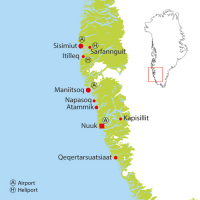 Aasiaat is North Greenland's educational centre and the town houses a regular school, a high school and a special school. Brættet is where today's catch like seal, whale and halibut is sold. In the fall you wild berries are sold as well. The Community House exhibits 24 paintings by the world famous painter, Per Kirkeby.